Dress Up Girl For Ballet is newest fashion design game for girls. Download Dress Up Girl For Ballet game app for free and start to make your best fashion story in top virtual fashion salon on your smartphone. Ballet is very popular sport for girls and boys who like to dance. We invite you to meet our ballet girl, and help her to dress up well for her first ballet performance. Our fashion ballet star is little bit nervous and scary, and she can not decide which dress to wear, how to make hairdo, and what jewellery to use. If you ever wanted to work as fashion designer to create beautiful elegant dresses, you are on right place. 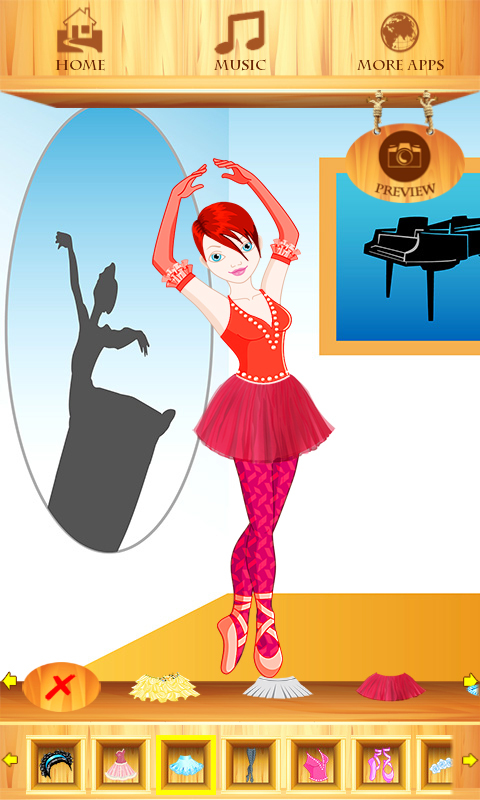 Dress Up Girl For Ballet app will help you to become greatest stylist. Enter to glorious fashion world and accept this cool dress up challenge. Open virtual fashion closet on your smartphone and find few top categories. •	Category with amazing ballet dresses, skirts & costumes. •	Categories with brand new hairstyles, flowers for hair and hairbands.